This is a combined blog for our Konocti Vista Casino contest in Lakeport, CA, and our Smokin in Mesquite contest in Nevada. In Konocti, we finished in 8th place of 36 teams with 4th Chicken, 12th Ribs, 21 Pork, and 8th Brisket. In Mesquite, we finished 19th of 47 teams with 22nd Chicken, 27th Ribs, 16th Pork, and 27th Brisket. So the burning question is what happened? Well, we’ve hit a funk as all winning streaks inevitably come to an end. 7 GCs and 3 RCs the past 5 months is a pretty darn good run. I take full responsibility for our performance and the errors and sloppiness that has crept in our cooking. I suspect the pace of driving hundreds of miles and cooking every weekend without any breaks that past 5 months has taken its toll on our ability to execute flawlessly every time. Be assured, we fully intend to rest, regroup, and recover with gusto. 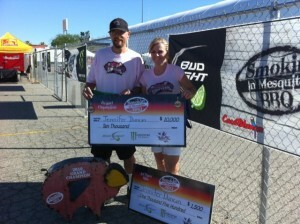 I’m ecstatic for my former BBQ 101 student Jennifer Duncan from Smoked to the Bone for winning GC at Mesquite. Jennifer beat out 40 of the best teams (all male) for this tremendous honor. Kudos to Jennifer for her success and her second GC. For Tommy, her husband, who is also a former student, I’ve got to work with him so he can someday score higher than Jen to get out of the pink outfits he has to wear if he can’t beat her! 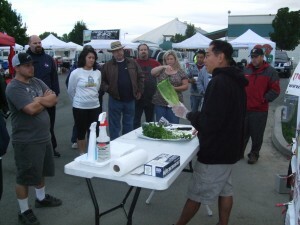 On Saturday morning at the Clearlake contest, Benny and I conducted a free clinic on how to do our Slap Yo Daddy Lazyman boxes. A BIG congrats go out to all the teams who participated and to Larry Hill for GC and Al of Big O’s for RC at Lakeport. 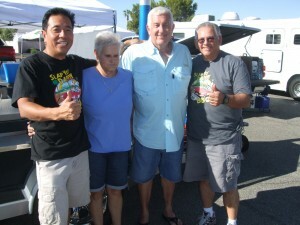 Congrats to Scotty from cancersucks.com for RC at Mesquite. A big thanks goes to all the organizers, judges, hosts, and helpers for organizing both events. 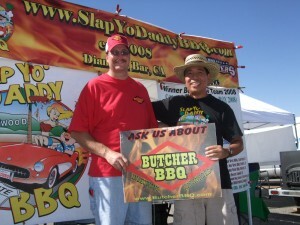 We’d like to thank our terrific Sponsors: Rocks BBQ System for our Stoker temperature control system, T&H Meat and Sausages for our meat products, TheSlabs.com for our rub products, Cajun Bandit for our Weber stainless replacment doors, Smokin Guns for our rubs , Butcher BBQ for our injections, and Snake River Farms for our Wagyu meat products. 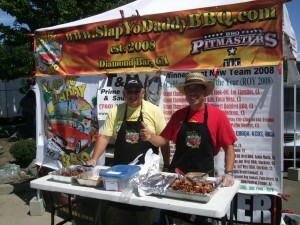 3rd Annual Smokin on the Water, Lakeport, Calif.